The State Archaeological Society of Missouri was created in 1935 by University of Missouri (MU) professors Jesse E. Wrench and J. Brewton Berry. Wrench and Berry began their study of Missouri Archaeology in 1931, but were unable to secure funding until 1934, when the Civil Works Administration, under Roosevelt’s New Deal, funded a two-week trial survey. Their work was successful and the Federal Emergency Relief Administration (FERA) approved a more extensive survey with 85 workers in 78 counties. A few people who believe that Missouri needs an archaeological society are planning to meet in Room 311 Jesse Hall, at the University, on Saturday afternoon about 4 o’clock, immediately following the general session of the Academy of Science. We should be very glad to have you attend. In connection with the archaeological survey which we have been conducting, we have been gathering the names of persons interested in the American Indian. We now have more than eight hundred names, and there are many others in the state of whom we have not heard. This number, through an organization, would be able to accomplish much for the cause of archaeology. We badly need an active organization for the purpose of (1) preserving important sites, (2) studying cooperatively our prehistoric remains, (3) attracting financial support for excavations, and for doing many other things that we, as individuals, could never do. There are strong, flourishing societies in a number of other states, and Missouri is, archaeologically, one of the most important fields in the country. We are inviting a small, selected group to meet for the purpose of discussing this matter, and we hope you will be there. The MAS was officially incorporated in January 1935. After the war, the Society shortened its name to The Missouri Archaeological Society (MAS) and began publishing a newsletter. By the end of 1947, there were four chapters and over 400 members. From 1948 to 1953, MAS resources were pooled for the excavation of Graham Cave. During this time, surveys and excavations were also conducted in the Bull Shoals and Table Rock Reservoirs on the White River and at the Bishop Mound in Kansas City. From 1955–1959, Society members excavated Jakie Shelter in the Table Rock Reservoir area. Also, in 1956, the Society influenced the Missouri congress to grant money for the excavation of the Missouri Basin. This legislation was historic in Missouri because it showed how, as a constituency, avocational archeologists could influence the government to be concerned with and to grant funding to archaeological affairs. 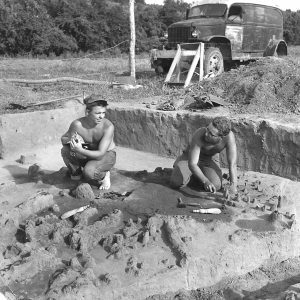 In 1959, the Lyman Archaeological Research Center and Hamilton Archaeological Field School began developments. These two centers immensely increased the strength of the Society by providing a base for training sessions, open houses, and meetings. These resources were officially opened at a Society-sponsored dedication in 1965. In the 1970s, increased interest in archaeology in Missouri led to the passage of Senate Bill No. 351 and House Bill No. 620, laws to promote preservation and protection of archaeological and historical resources on state lands. This act, passed in 1977, showed the growing political interest and participation in Missouri’s archaeology and was a great victory for the Society. In 1981, a period of inflationary cutbacks and changes in the American Archaeology Division at MU brought the Society to a point of renewal. Several members resigned, the MAS Newsletter got a new editor and look, and Michael R. Fisher succeeded long-time president Henry Hamilton upon his retirement. Like the economic situation, the MAS is slowly coming out of difficult times and making a new beginning. In March 1981 shortly after I took office, I visited the University of Missouri-Columbia to learn more about the Society and its association with the American Archaeology Division. I found grave problems surfacing for the Society and came home concerned and somewhat pessimistic about the welfare of MAS. Now, almost 3 years and 11 Board of Directors meetings later, I am still concerned but optimistic about the Society’s future. In 1984, the MAS Newsletter was replaced with the MAS Quarterly. After nearly 72 years at MU, the Society moved to Missouri State University in 2006. The Society continues to hold yearly meetings; produce the MAS Quarterly, The Missouri Archaeologist, and other special publications; has eight active chapters; has been active in the preservation of several sites; awards an annual scholarship; distributes thousands of posters and encourages activities across the state every September for Archaeology Month; and assists in surveys and excavations throughout Missouri. Now, the Society has close to 600 members and has surpassed its 80th anniversary.